The Royal Holloway University of London has been the venue for a number of concerts where the choir joined with other vocalists and musicians in the magnificent surroundings of their College Chapel. Tea on the terrace provided a refreshing interlude making these concerts an enjoyable springtime event for the choir and audience alike. The Parish Church of Englefield Green, St Jude’s, organise a series of afternoon concerts to which Voices Anon have been invited to perform a selection of Christmas music. The collection made at these concerts is donated to charity. 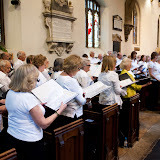 When members of the choir have family weddings there is sometimes a request for the choir to attend to sing anthems whilst the register is signed and during the service. The choir participated in the St Luke’s Christmas Tree Festival, a new event for 2011 introduced by the new incumbent, Sally Lynch. The choir donated and decorated one of the many Christmas Trees and lead the carol singing.